The latest innovation in the cotton industry merges two integral processes to offer growers a more efficient production of cotton. And more growers can get their hands on the technology too. Case IH manufacturing has gone commercial with cotton. The machine is the Case IH Module Express 625, which allows growers to save capital, fuel and labor by combining cotton harvesting and module building in a single operation. The Benson plant is ramping up production to fill orders for the Module Express in time for this fall’s harvest. The new machine continues a Case IH tradition of cutting-edge cotton technology.The Case IH Module Express has the potential to transform the cotton industry, because it’s designed to fit the needs of ginners as well as growers, says Trent Haggard, Case IH marketing manager for cotton harvesting. “Our engineers made sure that the Module Express fit with existing cotton production practices, with no additional handling, logistics or costs,” Haggard says. “That’s especially important when you consider that many of today’s cotton growers are also gin shareholders… ginning Case IH modules and traditional modules together is a seamless operation. A modern cotton gin that produces 60 ginned bales per hour will be equally maximized while ginning the Case IH module,” Haggard says. With the Module Express, a single machine does the work that previously required a picker, a boll buggy and a tractor to pull the cotton to a separate module builder operated by another tractor. That means operators can reduce their investment in fuel, labor and capital. Cost savings with the Module Express total 25 percent compared to traditional cotton harvesting methods, according to a study by Mississippi State University economist D.W. Parvin. “With this equipment you can cut your labor force by more than half. It makes life a lot easier,” says Jimmy Hargett, who field-tested four Module Express units on his farm near Memphis, Tenn. The Case IH Module Express utilizes an environmentally friendly, 16-foot tarp to protect bales from weather damage. Tarps are made of a reusable material to eliminate the risk of contaminating the finished product. If twine or plastic enter the harvest or module building system, it can be ingested into the cotton gin and even woven into the dyed cotton, resulting in a defective garment. The Module Express offers productivity advantages in the field, too. 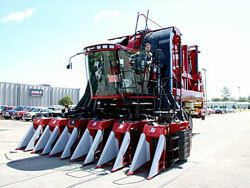 Compared to a traditional module, the Case IH module is not pressed into the ground. The densely packed module can be loaded into the truck more easily, with minimal waste.